Myocardial stents (both bare metal and drug-eluting varieties) are widely utilized to prevent restenosis following percutaneous transluminal coronary angioplasty (PTCA) and coronary intervention (PCI). Indeed, by 1999 myocardial stents were inserted in 4 of every 5 patients undergoing PCI.1 It now appears what is good for the heart may be good for the brain, too! Because medical treatment of symptomatic intracranial stenosis carries a high risk of stroke, neuro-interventionalists (interventional neurologists, endovascular neurosurgeons, and interventional neuroradiologists) are finding increasing application for stents in cerebral vessels with symptomatic severe stenoses that are refractory to best medical therapy. The main goal of the angioplasty and stent placement is to improve blood flow. Some of these lesions may manifest symptoms only after they become extremely tight, and even relatively minor corrections in the degree of stenosis may improve symptoms and outcomes. Flow is proportional to the fourth power of the vessel’s radius. This means that the flow is approximately doubled when the radius is increased by 20% or the diameter by 10%, so that small increases in the luminal diameter may result in large increases in the flow. 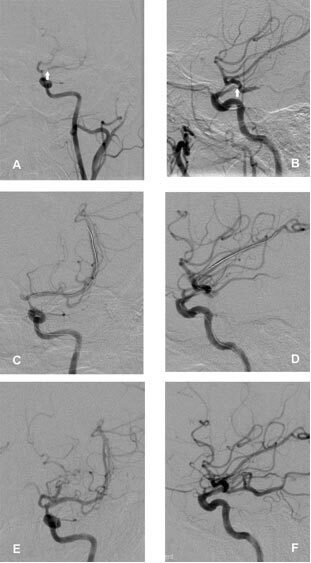 Figure 2: These two figures demonstrate successful dilation of a >90% stenosis in the left middle cerebral artery of a 53-year-old woman who had been having multiple left hemispheric TIAs (mini-strokes) while on maximal medical therapy. After balloon angioplasty, a Wingspan™ stent (radiographic markers denote the proximal and distal boundaries) was inserted to optimize the vessel lumen. Figures 2A and 2B show the >90% stenosis in the proximal M1 segment of the left middle cerebral artery (white arrows). Figure 2A is in the anterior-posterior projection (front view), and Figure 2B is in the lateral projection (side view). Figures 2C and 2D show the balloon catheter and microwire across the stenotic lesion and how the vessels have improved in size post-angioplasty. Figures 2E and 2F show the final result post-balloon angioplasty and Wingspan stent placement with no residual stenosis in the left middle cerebral artery. Richard C. Prielipp, MD, MBA, FCCM is the J.J. Buckley Professor and Chair of Anesthesiology; Adnan I. Qureshi, MD, is a Stroke and Interventional Neurologist and Professor of Neurology; Steven J Haines, MD, is a Professor of Neurosurgery; and Vallabh Janardhan, MD, is a Stroke and Interventional Neurologist and Assistant Professor of Neurology, Neurosurgery, and Radiology at the University of Minnesota in Minneapolis, MN. Serruys PW, Kutryk MJB, Ong ATL. Coronary-artery stents. N Engl J Med 2006;354:483-95. Henkes H, Miloslavski E, Lowens S, Reinartz J, Liebig T, Kuhne D. Treatment of intracranial atherosclerotic stenoses with balloon dilatation and self-expanding stent deployment (WingSpan). Neuroradiology 2005;47:222-8. Epub 2005 Mar 15. Gawaz M, Neumann FJ, Ott I, et al. Platelet activation and coronary stent implantation. Effect of antithrombotic therapy. Circulation 1996;94:279-85. Caramori PRA, Lima VC, Seidelin PH, et al. Long-term endothelial dysfunction after coronary stenting. J Am Coll Cardiol 1999;34:1675-9. Eagle KA, Berger PB, Calkins H, et al. ACC/AHA guideline update for perioperative cardiovascular evaluation for noncardiac surgery-executive summary: a report of the American College of Cardiology/American Heart Association Task Force on Practice Guidelines (Committee to Update the 1996 Guidelines on Perioperative Cardiovascular Evaluation for Noncardiac Surgery). Circulation 2002;105:1257-67. Newsome LT, Kutcher MA, Gandhi SK, et al. A protocol for the perioperative management of patients with intracoronary drug-eluting stents. APSF Newsletter 2006-07;21:81-2.